The Pew Research Center’s studies about libraries and where they fit in the lives of their communities and patrons have uncovered some surprising facts about what Americans think of libraries and the way they use them. As librarians around the world are gathered in Las Vegas for the American Library Association’s annual conference, here are findings that stand out from our research, our typology of public library engagement and the quiz we just released that people can take to see where they compare with our national survey findings: What kind of library user are you? 1 Each time we ask about library use, we find that those ages 65 and older are less likely to have visited a library in the past 12 months than those under that age. 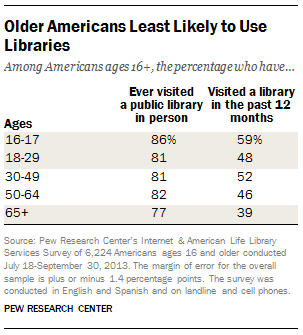 Equally as interesting is the fact that younger Americans (those ages 16-29) are just as likely to be library users as those who are older. 2Although 10% of Americans have never used a library, they think libraries are good for their communities. We’ve identified this group of library users as “Distant Admirers,” and they are the majority of the nearly 15% of Americans ages 16 and older who have never been to a library. Despite their lack of personal use of libraries, their positive views of libraries might stem from the fact that 40% of Distant Admirers report that someone else in their household is a library user. About two-thirds of them or more say libraries are important because they promote literacy and reading, that they play an important role in giving everyone a chance to succeed and they improve the quality of life in a community. Finally, 55% say the loss of the local library would be a blow to the community. 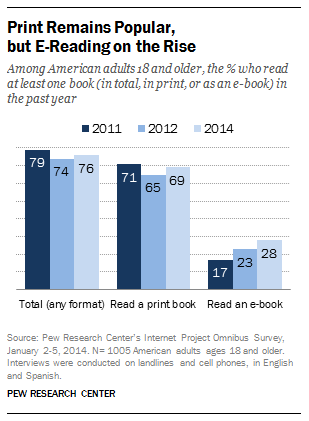 3 E-book reading is rising but just 4% of Americans are “e-book only” readers. The incidence of e-book reading has been steadily climbing during the course of our libraries research. It now stands at 28% of the population who have ever read an e-book. But this has not really affected the number of those who read printed books. The vast majority of e-book readers also enjoy printed books. 4Those who read both e-books and printed books prefer reading in the different formats under different circumstances. One of the reasons many book lovers read in both printed and e-book formats is that they feel each format has its own virtues. In a head-to-head competition, people prefer e-books to printed books when they want speedy access and portability, but print wins out when people are reading to children and sharing books with others. When asked about reading books in bed, the verdict is split: 45% prefer reading e-books in bed, while 43% prefer print. 5 One of the big concerns in the publishing industry about selling e-books to libraries is that allowing free access to e-books through libraries might eat into book sales. 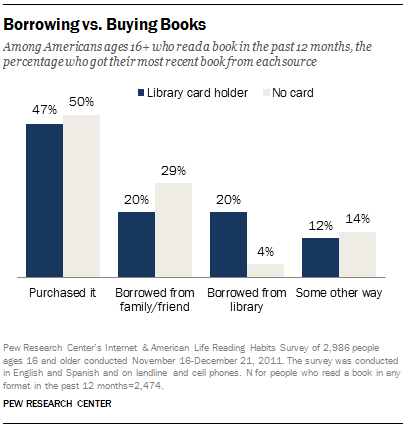 In fact, Pew Research data show that those who use libraries are more likely than others to be book buyers and actually prefer to buy books, rather than borrow them. Among the 78% of Americans 16 years and older who had read a book in the previous year, according to a survey we did in 2011, a majority of print readers (54%) and readers of e-books (61%) said they prefer to purchase their own copies of these books rather than borrow them from somewhere else. 6One of the foundational principles of librarians is supporting the privacy of patrons. Librarians have long resisted keeping or sharing records of the book-borrowing or computer-using activities of their patrons. However, in the age of book-recommendation practices on all kinds of websites, many patrons are comfortable with the idea of getting recommendations from librarians based on their previous book-reading habits. In a 2012 survey, 64% of respondents said they would be interested in personalized online accounts that provide customized recommendations for books based on their past library activity. Some 29% said they would be “very likely” to use a service if it were made available by their library. 7Many librarians are struggling to figure out how to think about their book collections in the digital age. The responses in a 2013 survey was the most divided verdict we got in the range of changes in the library world that we probed. Some 20% of respondents said libraries should “definitely” make changes with the ways they arrange their books, such as moving some print books and stacks out of public locations to free up more space for tech centers, reading rooms and cultural events, according to our 2013 survey. However, 36% said libraries should “definitely not” make those changes and 39% said libraries should “maybe” consider moving some books and stacks.